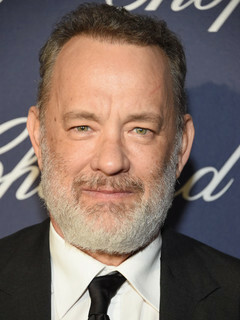 Born in California, Hanks grew up in what he calls a "fractured" family. His parents were pioneers in the development of marriage dissolution law in that state, and Hanks moved around a lot, living with a succession of step-families. No problems, no abuse, no alcoholism, just a confused childhood. He had no acting experience in college and, in fact, credits the fact that he couldn't get cast in a college play with actually starting his career - he went downtown, auditioned for a community theater play, was invited by the director of that play to go to Cleveland, and there his acting career started. He met his second wife, actress 'Rita Wilson' on the set of the his television show Bosom Buddies (1980), she appeared in one episode in the second season (1981). They have two children and Tom has another son and daughter by his first wife. In 1996, he made his first step behind the camera, directing as well as starring and writing the film That Thing You Do! (1996). Favorite baseball team is the Cleveland Indians. He purchased a stone in the front of Jacob's Field when it was built. Attended California State University, Sacramento. Received American Film Institute's Life Achievement Award, presented by fellow Oscar winner 'Steven Spielberg' (qv), the youngest ever to receive that award (12 June 2002). Is the second most-represented actor (behind 'Sidney Poitier' (qv) and 'Gary Cooper (I)' (qv)) on the American Film Institute's 100 Most Inspiring Movies of All Time, with four of his films making the list. They are: _Forrest Gump (1994)_ (qv) at #37, _Philadelphia (1993)_ (qv) at #20, _Apollo 13 (1995)_ (qv) at #12, and _Saving Private Ryan (1998)_ (qv) at #10. 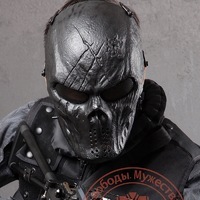 He once shared a record (with 'Tom Cruise' (qv) and 'Will Smith (I)' (qv)) as the actor to star in the most consecutive $100 million-grossing movies (7). As of 2008, Smith holds the record alone with 8 movies. Between 1994 and 2004, he was the performer nominated for the most Academy Awards (four times, along with 'Sean Penn (I)' (qv), 'Meryl Streep' (qv), 'Julianne Moore (I)' (qv), 'Judi Dench' (qv) and 'Ed Harris (I)' (qv)) and won the most (twice). His ancestors originally came from England. 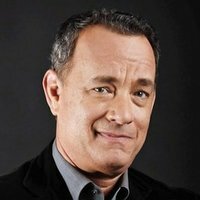 The name "Hanks" can be traced back several centuries. Is a member of the International Thespian Society (a group supporting theatre for high school students internationally).